The winners will be chosen by a panel of judges made up of one member of each participating school. Prizes will be given to first, second and third place for each the poster and the video contest. 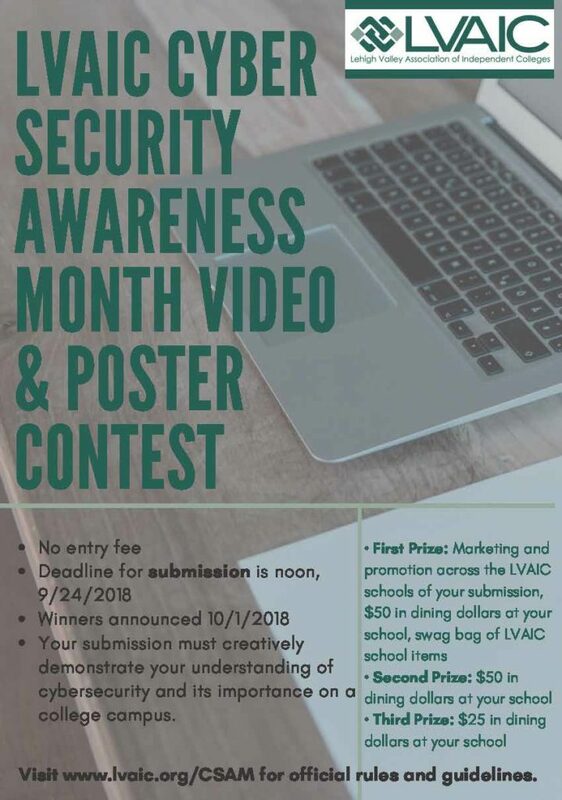 Those who receive first prize will also have their video or poster marketed across LVAIC to promote Cybersecurity Awareness Month with their name attached. There is no entry fee. The deadline for submission is noon, Monday, October 1, 2018. Winners will be announced Monday, October 8, 2018. Eligibility: Prizes in the contest will be awarded to the best video or poster submitted by an individual or group of currently enrolled students. Participating students must be at least 18 year of age by the deadline of submission. Your submission must creatively demonstrate your understanding of cybersecurity and its importance on a college campus. It must be original and unique and comply with the submission guidelines as stated in this document. Official rules and guidelines are available here. Submit your video or poster using this link.